Family reunions have been gaining in popularity for the past several decades and show no sign of slowing. The average family reunion trip lasts five days and includes eight adults and four children. Families' most cherished reunion memories are simply made of "spending time together" (81 percent), followed by group meals (60 percent). In fact, more than half of respondents also said "cooking great food" is the best way to impress the family. The top ways to offend family members are "drinking too much" (28 percent), followed closely by "paying too much attention to your phone or tablet" (26 percent) and "being a cheapskate" (15 percent). One-third of travelers selected a vacation rental as the ideal accommodation for a family reunion. Perhaps that's because vacation rentals are generally twice the space at half the cost of a hotel room, and offer vital amenities for families to spend time, cook, eat, play and make lasting memories together all under the same roof. Don't do it alone. This is, after all, a family reunion. Involve family from the start. Ask for donations to help offset early expenses. Survey the group's skills and talents, and ask for volunteers. Can someone cater a picnic? Can teens set up and maintain Web and Facebook pages? Can a bookkeeper or accountant be your treasurer? Can moms and teachers provide games and activities for the kids? Praise them in all your correspondence and at the reunion. It will ease future recruitment. Give yourself enough time. If this is a first-time reunion and you plan to invite a large group, you must allow a year or more for planning. Members may need to request vacation time from work and some may need to save money to make the trip. Many details need attention, and the earlier you start, the better off you'll be. There are many advantages to reserving your venue early. You get exactly what you want and, in some instances, you lock in prices before they go up. You also need time to order souvenirs (such as t-shirts), and to gather information and arrange printing for directories, cookbooks or histories. Advance planning ensures that you'll be handing them out at the reunion, rather than devoting additional time and expense to mail them after the reunion. Set a date and stick to it. Selecting a date can be one of your most complicated tasks (unless your reunion celebrates a milestone birthday or anniversary, in which case the date is set). Check with others to see if there are any calendar conflicts: weddings? graduations? trips? Send a save-the-date message as soon as your date is set so everyone knows not to schedule anything at the same time. Do NOT change the date under any circumstances; but be prepared, because as soon as you announce the date, I guarantee that the first person you hear from will not be able to come. Tell him/her how sorry you are that there's a conflict, but perhaps next time will work. Location, location, location. Like all things in life, location can make or break a reunion. First you must decide where that place will be ... Will it be near or far away? Is it urban, suburban or rural? Will it have historical significance to your family? Will weather and season make a difference? What attractions, entertainment and sports are nearby? Convention and visitors bureaus are good starting points for researching an area, and most of their services are free. 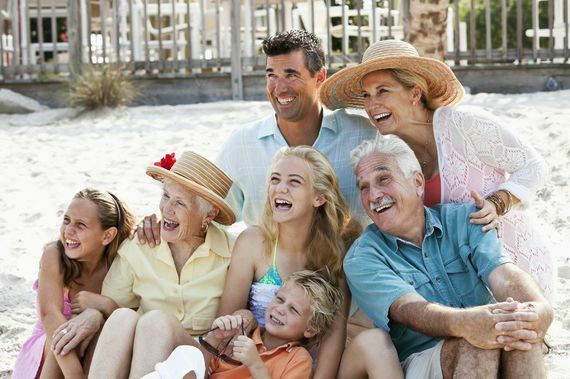 Pretty much any spot where families can go on vacation is also suitable for family reunions, so long as there is space to accommodate the number of people. HomeAway.com offers a 'sleeps' sort function where you can select the number of people to accommodate, which can also help with trip planning. Make your reunion affordable. One significant difference between family reunions and all other reunions is that all ages, abilities, resources and life stages must be taken into account. You must consider young families who are always strapped for cash, seniors who are living on fixed incomes and everyone in between. Make your choices with all income levels in mind so that the reunion is affordable for everyone. Some families collect donations and plan fundraisers before and at the reunion to cover some costs for members who would have a hard time affording the reunion. Others use fundraising for scholarships for the young generation. lan something for everyone ...but don't overplan. Know your reunion attendees and their interests to plan activities that will involve all ages and passions. Then, make sure you know how/where they can do what they love to do while they are at the reunion. If golf is important to your group - as it is to 20% of reunions - make sure it is on the agenda. Games and crafts engage young members, while amusement parks are just right for teens. Shopping? Gambling? Hiking? Biking? Swimming? Even if it's not your cup of tea, if you offer the possibility you will have happy reunion-goers. Plan events that will involve all members together and remember to include time to just sit, talk, reminisce and be together. Edith Wagner is publisher and editor of Reunions magazine and www.reunionsmag.com.